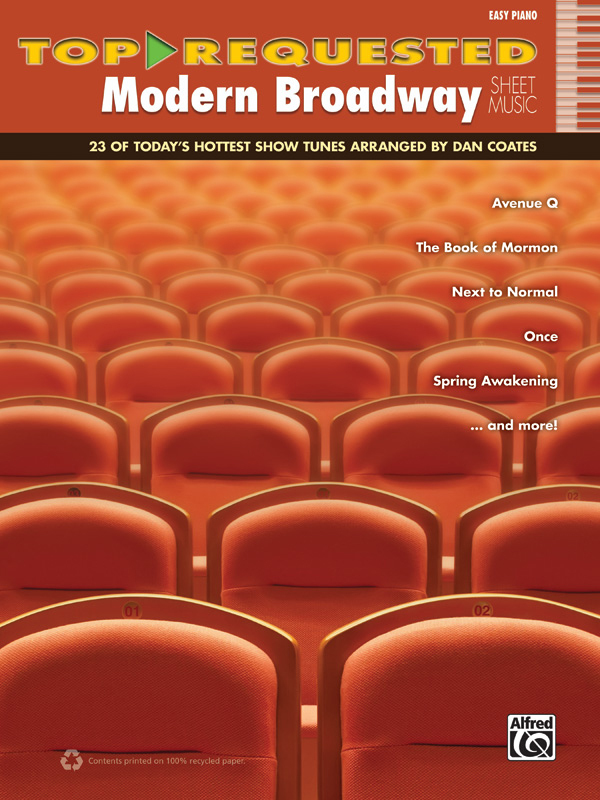 * For pianists who love contemporary musical theatre, this collection contains easy-to-play arrangements of standouts from Broadway's hottest new shows and revivals. * Great show tunes from the Broadway-oriented NBC TV series SMASH are also included. * Showcasing a wide variety of styles, from touching ballads to over-the-top comedy numbers, the songs in this collection are guaranteed to entertain! * The melody is played by the right hand in these arrangements, so they sound great either as piano solos or for singing along. * Titles: Already Home (Andrew Lloyd Webber's new production of The Wizard of Oz), Any Way You Want It (Rock of Ages), Dancing Queen (Mamma Mia! ), Don't Forget Me (SMASH), Don't Stop Believin' (Rock of Ages), Falling Slowly (Once), Fly, Fly Away (Catch Me If You Can), Goodbye (Catch Me If You Can), I Believe (The Book of Mormon), I Have a Dream (Mamma Mia! ), I'm Alive (Next to Normal), Let Me Be Your Star (SMASH), Mama Who Bore Me (Spring Awakening), Nice Work If You Can Get It (Nice Work If You Can Get It), Red Shoes Blues (Andrew Lloyd Webber's New Production of The Wizard of Oz), Secondhand White Baby Grand (SMASH), Someone to Watch Over Me (Nice Work If You Can Get It), Superboy and the Invisible Girl (Next to Normal), There's a Fine, Fine Line (Avenue Q), 21 Guns (American Idiot), Wake Me Up When September Ends (American Idiot), When Your Mind's Made Up (Once), You and Me (But Mostly Me) (The Book of Mormon).